Music lovers have a craving for Vinyl. During the recent past, it has become a much more popular medium for music listeners. With the developments in the field of technology, music players and digital recorders have taken over. However, the sound quality from classic recorders remain unmatched. One of the best qualities of record players is their analog sound which can never be matched through a digital speaker. To stay with time as well as their olden days love, music lovers have been trying to find ways to integrate their record player with the latest technology. Is there a way to make a modern stereo system with the old record player? Well fortunately, yes! Your record player can now adapt to different electronic gadgets and devices so that you can enjoy the newest tracks with the highest quality sound from your record player. So if you were planning to throw away your old record player just because you thought it’s no more of use, you should revisit your ideas. This article will guide you to about how to make your very own hybrid stereo system. We will see step by step how you can synchronize your vinyl with your computer or other systems. We can help you make a stereo system that you can use at your home, picnics and parties. We shall first see the basic ingredients that make a hybrid stereo system. You should know that it’s not always about the most expensive devices and gadget that will make the best stereo system. We shall see how you can design a good stereo system in minimal cost. If you do not have a record player as yet, we will help you buy one. Keep the following considerations in mind while buying a record player. There are several classes of record players that vary in cost, type and performance. We shall see some of the major classifications of these record players so that people with different tastes of music recorders can choose their player accordingly. The major quality of these record players is that they have very few parts which makes them a low cost and affordable turntable. It has a tone arm the moves in an arc as it pivots about a fixed point. Since it has very few parts, the risk of part failure is minimal and therefore it doesn’t require too much of maintenance either. There can be a few rate errors due to difference in the playback and mastering method. However, these errors are low magnitude and probably negligible. The audio quality does not vary a great deal since it is a single tone arm turntable. are run through a motor. The rotation of the motor causes vibrations in the turntable. However, there are lesser vibrations in a Belt Drive Turntable as the motor is mounted away from the platform. They are connected together through a belt. It is quite cost effective as the belt is cheap and easily replaceable at home. The needles of this turntable are available in good quantity so part replacement is also quite easy. The only disadvantage of this turntable is that as time passes, the belts tend to age and gather dust and other particles from the surroundings. This in turn effects the rotation of the platform which directly affects the sound quality. Cleaning and replacing the belt is important for better sound quality. It closely follows the mastering method and the tone arm moves linearly. Therefore, the output sound is much closer to the original sound. However, most modern players are now equipped with rotating arms and motored devices. Therefore, the sound quality is distorted somewhat. The design is quite sophisticated and understandably expensive. So the overall cost of this turntable is higher than others. However, due to its precise motor control, the sound quality of this player is its biggest plus point. This type of turntable has a compact design. The driving motor is located right beneath the rotating platform so it occupies lesser space. However, the motor can cause vibrations that can affect sound quality. Moreover, the motor can add distortion and noise as it is not insulated well enough. The rotating mechanism is quite complicated and therefore expensive. 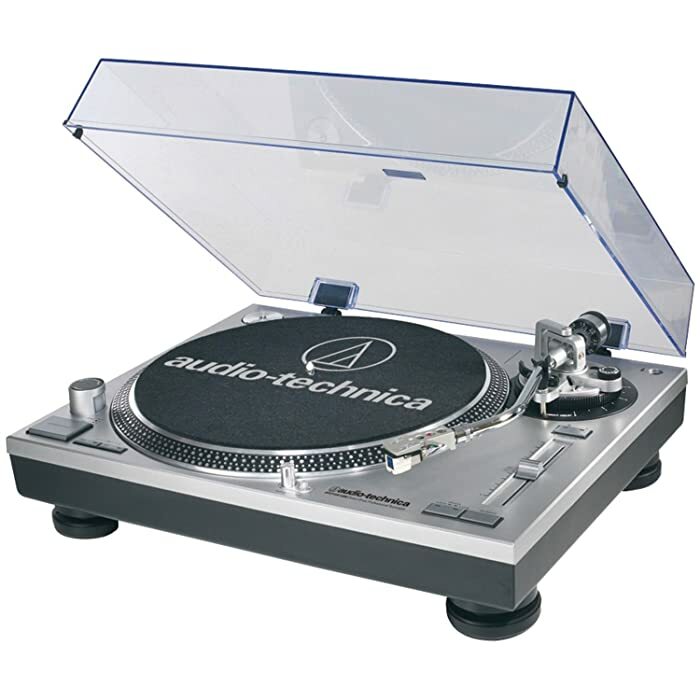 Maintenance and part replacement is also a concern with this type of turntables. Its biggest advantage is its size which you can carry around at your picnic and parties. For any stereo system, the sound quality is hugely dependent on the speakers. Regardless of how good your music player is, if the speakers aren’t well, you won’t get the best results. Most of the modern speakers are compatible with any type of record players so there is a wide variety of speakers to choose from. It is just a matter of how much you can spend. Sound quality in this case is more dependent on your budget. Many of the record players come with complimentary speaker. These speakers are most compatible with the turntable and therefore they offer the best sound quality. However, you can opt for speakers separately if you like. Vintage players are also compatible with smaller speakers so it gives more options for portability. Needles and cartridges are the most instrumental elements in a record player as they heavily impact the sound quality. It is always a good idea to purchase cartridges in a larger quantity. Their purchase can be difficult at times. It is quite important to closely check a needle for any type of damages before installing it to the record player. In case you install a damaged needle, it can mark scratches on your float table. Cost is highly important while buying a replacement cartridge or needle. Some high quality needles and cartridges can cost more than the record player itself. If you are planning to make a high quality stereo system then you may have to spend a few more bucks. Another basic requirement for your stereo system is your stereo receiver. Most vintage recorders are compatible with a phono input. However, modern receivers do not entertain phono input. To help out with this, modern receivers are to be attached with a phono preamplifier that produces are greater amplitude so that the input from a tape or a CD can be received. The most important aspect of connections is grounding of all the elements. If the devices are not grounded, they can add unneeded noise that can affect the sound quality considerably. A ground connector is therefore essential in all stereo systems. Connect all ground spots of the devices together through this connector for a better sound quality. The cable quality is also important. Proper copper wired cables are most suitable for the job. The better the connectivity the better the output sound quality. To avoid mixing up cables and for a cleaner look, you should tie up all the cables together through a cable tie. Make sure you don’t tighten the cables too much as pinching a sound cable can reduce the life span of the cable. Also digital interconnect cables tend to leak signals that can create distortion sometimes. Most of the modern turntables have the ports for RCA cable connections. This allows users to plug in the cables anytime they like. Older turn tables had built in connections so you had to carry around the player with the wire all the time. Replaceable connectors also produce better sound quality. These are all the basic requirements of a simple stereo turntable. These turntables can be optimized for better performance. There are more parts and elements you can integrate with your turntable stereo. It mainly depends upon the type of application that you want. Also these optional components are best for those who want extra high quality of sound. Some of these components may be expensive while others are affordable and cheap. Analog to Digital Converters (ADCs) are used for digitalizing an analog voice signal. This is more useful for long range transfer of data. Analog signals have the tendency to superimpose with the signal in the air and therefore it can distort the quality of sound. ADCs are good noise suppressers while creating good quality sound. An output USB port is quite ideal as it makes file transfer from a computer quite easy. ADCs are quite efficient especially if you wish to transfer sound through Wi Fi. It is always good to have a user manual not only for a record player but for any electronic device. They can assist you to familiarize with your recorder. These manuals are available on the internet as well as in the markets at low costs. Once you have the components and elements with you, you now need to install the elements all together. First you need to design the physical layout and see according to the location of your stereo system. You should plan out your cabling scheme. Make sure to design it in a way that they do not twist and turn which can cause them to break. Enable yourself with sufficient space so that you can work conveniently. The setup can take around an hour so you should prepare yourself first. Turntables are delicate instruments. The quality of sound can be damaged with the slightest of miscalculations and poor alignment. Therefore, it is important to have a firm and stable base. In case your base is unstable, the floating platform may not rotate effectively. Also, there is a chance that the needle doesn’t set exactly on the spot. Keeping your stereo on a flat, firm base is very important for a good output sound quality. Some people place their recorder on the speakers. This creates a feedback loop causing distortion and mixing of sound. Hence, reducing the sound quality considerably. This is a major element when it comes to quality listening experience. Placement of speakers is very important because the sound quality and acoustics are directly dependent on it. The best place for installing the speakers are the corners of a room. In this way you can cover a larger area and also it gives an effect of surround sound which is always intriguing. It also depends on your speaker type. If you are using small speakers that can be adjusted on top of a shelf, you may want to install the speakers at a higher place facing downwards diagonally. In case you are using larger speakers, you can simply place them on the floor at a corner of the room. So now you know how you can still use your old fashioned vintage record player and listen to your favorite tracks and music. Integrating your turntable with the latest devices and music players is far easier than you might have thought and after reading this article, you might be tempted to buy a record player of your own. When it comes to space consumption, your record player stereo system may not be able to substitute your MP3 player and iPod. However, it can definitely compete with them when it comes to sound quality. You need not to throw away your old record players, you can link your computer with the turntable and still enjoy the old classic tracks from your childhood. A new usage of your record player will take you back to the old days where you played around your granddad when he sat on the arm chair listening to the same old record player. It is not just a new system integration, in fact, it is the revival of an astounding technology that opened the gates towards experiencing music through a smallish gadget. You can now go on to buy your favorite music player turntable at cheaper costs and better efficiency. Many online markets and websites such as eBay also have a large collection of vintage record players.